Construct a rubber-band-propelled model airplane with the D.C. Maxecuters and test fly it in the Great Hall. Flying in the Great Hall, 11:00am - 4:00pm, Free. Drop-in demonstration. All ages. Witness death-defying feats of acrobatic aeronautics—on a small scale. 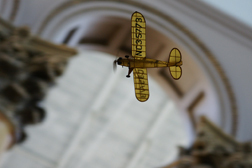 Watch as the D.C. Maxecuters fly their model airplanes through the Great Hall!